Unit is designed so the staircase can either be on the left or right side.The unit can be used to ..
Small storage unit with doors and drawers. Hand waxed to give a lovely light rustic finish. It's complimented with black metal handles. Flat packed for home assembly. Delivery 3-5 days. The unit is designed so the staircase can either be on the left or right side.The unit can be used.. The Corona magazine table combines magazine storage space and drawers. Would look great as a la.. 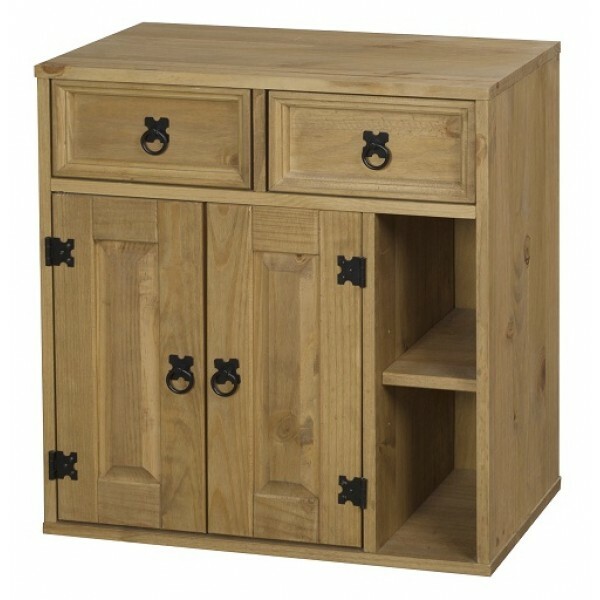 The Corona Pine Waxed finished corner unit is a functional and attractive piece of furniture design.. The Corona Pine Waxed finished Coffee Table is a functional and attractive piece of furnitu.. The Corona Coffee Table is a functional and attractive piece of furniture designed to fi.. This set comes as multiple purposes, all lovingly crafted with Pine wood which are complemen.. The Corona bar stools are functional and attractive piece of furniture designed for a traditional s.. The corona Corner computer desk has a sliding keyboard and plenty of drawers for storage.The Cor.. The simple Santos Computer Desk in Beech finish made from strong mdf panels. It has a storage space..